I might be a dog, but that doesn't stop me travelling like a human. So here we are, we’ve safely arrived at our destination in Norway! And its fantastic. So far its everything mum told me it would be and more. But before I go on to tell you about our Nordic adventures I have a tale to tell about the journey over here. The 1,400 miles that our Audi or Xena as she prefers to be called drove like a warrior to get us here safely. The adventure started in the early hours of Thursday 30th August, I went for a nap as usual around 9pm, woke up with a start and thought we’d been burgled, only to find my parents packing the car and filling the roof-box, I was sure mum said we’d paid the rent this month, why were we acting like a family going on the run? Typical British, packing the sandwiches and setting off early, we need to miss the traffic! Bags, bikes, boxes, people, dogs & Xena. Mum discussed a few different options for ways over to Norway, we chose the Euro Tunnel but some alternatives are listed at the end of this blog. 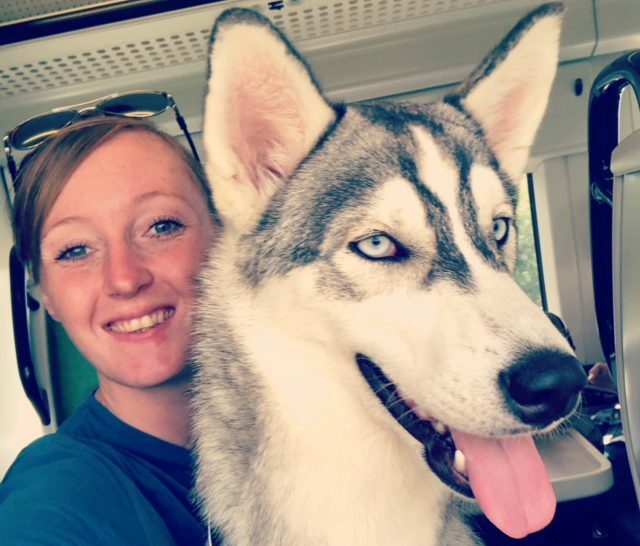 EUROTUNNEL – we decided on this route as mums such a softie she didn’t want to be apart from me and my sisters. She wants us to experience things as a family, sometimes she forgets I’m a dog. The process at the tunnel was easy, lots of sign posts and a pet friendly play park right before getting onto the train. After an 8 hour drive the three of us were full of enthusiasm for the tunnels, bridges and other obstacles on offer in the park. My Border Collie sister was her usual self looking for things to round up, unfortunately a poor Bichon Frise was the guy, I think he secretly enjoyed a bit of a flirt. The rules are dogs stay in cars whilst in the tunnel. Mum was allowed out of the car and was able to open the boot if she needed, but actually we all just slept after the play park activities and free pawsecco that they give out, if I’m honest I was a bit tipsy! We made it to Europe!! Stay on the right side of the road mum! The next leg of the journey was sleep, toilet break, eat, sleep toilet break eat! One minute I was howling Bonjour out of the window, the next I’m in Germany ordering a schnitzel. The world really did feel like our oyster. After 15 hours on the road we had a well deserved break in Eindhoven where we stayed in a Campanile hotel, perfect for dogs – bottom floor access with good local walks to stretch the legs. Sunset in Eindhoven, a short walk from the hotel. My parents are impatient people and wanted to get there yesterday so the break wasn’t long, just time for a walk, shower and a nap. Me and my sisters had been sleeping all the way but we had to let the humans have some rest. Next stop Denmark! We made good time a Xena just kept on going. Again there were a few different options for routes across to Norway. We chose the ferry from Hirtishals to Kristiansand taking 2hrs 15 minutes. We arrived in plenty of time and in hindsight should have stayed at ‘the last shop’ 10 minutes before the ferry terminal. This wasn’t a lie; this was the last shop! The terminal was a cabin with a toilet and coffee machine, it was a long 2 hours wait for the ferry. What if the car rolls off the ship…. It was a long two hours…. for her! Reunited! Look how sleepy Halo is. We were sound asleep, full of yawns and sleepy eyes when she returned in a frenzy. I honestly don’t know what the fuss was about. We even had company, there was a Labrador in the car next to us. We had a bit of chat through the openings in the window, difficult seen as she was Dutch but we managed. Then every now and again a man in uniform would pass by, I presume my mum sent him to check on us. And finally we’ve made it to Norway!! FLY – As our trip isn’t just a couple of weeks’ holiday we needed more luggage than what could be taken by plane. But as far as we know there are a few options for airlines travelling from the UK that will allow pets as cargo passengers. FERRY – The next option was by ferry; there used to be a direct ferry Newcastle – Stavanger, handy you say? Yes, it would be if it was still running. Newcastle – Amsterdam with pet friendly cabins for small/medium sized dogs. Well I don’t care how much brushing and de-fluffing my sister has and how many different angles she looks at herself in the mirror, she’s not fooling anyone, sorry Tego you are not a medium sized dog. For us the cabins weren’t an option as we are a 3 dog family and they only allow up to two. There’s the option for pet kennels but mum likes our company too much to want us to go into there. Hull – Rotterdam also have on-board kennels, requires booking and is checked on a 2 hourly basis by staff. Harwich – Hook of Holland route allows for dogs to travel in your car or in the ships pet kennels, your allowed to access the kennels throughout the journey to check on your pets.